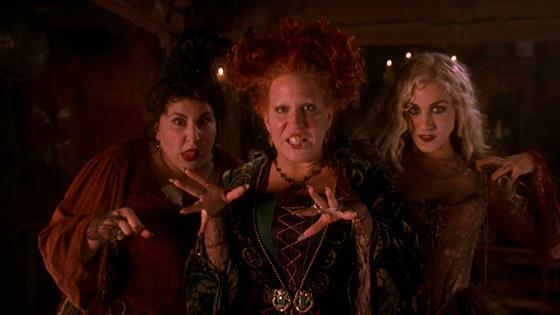 25 years later, it's still just a bunch of Hocus Pocus on Halloween. It's hard to believe the iconic Disney movie starring Bette Midler, Sarah Jessica Parker and Kathy Najimy as three witch sisters who return from the dead thanks to a virgin lighting the Black Flame candle came out in 1993 as it's become a staple each and every year come October. Seriously, Freeform has the movie playing 28 times during its 31 Nights of Halloween programming, including an all-day marathon on Halloween (October 31). And to celebrate the milestone anniversary, the network is hosting a Hocus Pocus 25th Anniversary Halloween Bash special, featuring appearances from the cult-classic's original cast and creative team, performances by Dove Cameron and PrettyMuch, with Vanessa Hudgens and Jordan Fisher hosting the spooky event. At the taping of the Freeform special, E! News chatted with director Kenny Ortega and the film's stars, including Omri Katz, Thora Birch, Vinessa Shaw, and many others, to get their memories of making the iconic movie. Ready to run amok, amok, amok with nostalgia? 1. Did you know the original title of the movie was actually Halloween House? Eight years and about 11 writers later, it became a much less scarier movie. 2. Per producer David Kirshner, the role of Winifred Sanderson was written for Cloris Leachman because of her turn in Young Frankenstein. As we all know, Bette Midler took on the role, turning in a performance for the spellbooks. 3. Production initially started out in Salem in November. Great for fall foliage. Not so great for decorations. "A lot of the trick or treating we did in the old town of Whittier," Kirshner said. "Everybody had their Christmas decorations! We had to pay everybody, block-by-block, to take down their Christmas decorations!" 4. While Dani (Thora Birch) was a smitten kitten when it came to Binx, Birch wasn't as enamored with the cat IRL. "There were seven different live cats, two different animatronic ones and something that didn't even exist, it was like an X on a lamppost and they were like, 'There's Binx!'" she said. "I never knew exactly what I was coming into it, ad truth be told, don't let anyone know, I'm not a cat person!" 5. Birch, however, was definitely a fan of the actor who portrayed Thackery Binx in the flesh: Sean Murray, who now stars on CBS' NCIS and has remained a '90s heartthrob despite only being in a couple of scenes. She admitted to having a bit of a crush on him during filming, saying, "He was dreamy! He was cute, definitely!" For Vinessa Shaw, who played Allison, she said the teen actors "were kind of more like brothers and sisters. We just had fun, like fun friends together. We definitely were goofing around on set all the time. I think we were still not mature enough to do any pranks on anyone, we just loved each other. It was a very sweet time!" 6. Speaking of Thackery though, did you know that Murray's voice wasn't used for the cat version's voice? It was Jason Marsden. 7. The Sanderson Sisters' iconic cottage? The film crew actually built the entire thing and the surrounding graveyard, a rarity for most sets. And for Birch, it's what she remembers most about filming the movie, along with a cast trip to Salem, Mass. "It was the largest, most elaborate set I've ever been on," she said. "That was a real personal Disney moment. I heard Tinkerbell flying around!" 8. Legend has it that Leonardo DiCaprio was this close to being cast as Max, the movie's leading man. And it's sort of true. "Well, he wasn't almost Max.I was told before he came into meet me that you're not going to be able to have him, but he wanted to come in and met you," Ortega explained. "It was so great. I was grateful to have met him at that time in his life. It was right at the beginning—he went on to do [What's Eating] Gilbert Grape and [This] Boy's Life. I love that I got a chance to meet him and he came in to see me." Omri Katz eventually landed the role, with Ortega saying, "I was ever so grateful that we found Omri and [he] is beautiful in the film." 9. Despite being a movie all about Halloween, Hocus Pocus was initially released in July 1993. And didn't exactly scare up big box office numbers at the time. "Of course, I was disappointed when it didn't come out of the gate stronger, but I mean it was released in July, And I was still young and coming into the industry as a director, and was like, well, maybe somebody knows something that I don't know," Ortega said, "But no, we made a Halloween movie! There's nothing bigger that screens during this holiday than Hocus Pocus!" As for the negative reviews, Ortega remembered one in particular saying, "The problem with Hocus Pocus is it doesn't know what audience it's for." His response now? "25 years later, I can confidently say to them, yeah, we did. We were going for everybody!" 10. The infamous bullies Ernie Ice (Larry Bagby) and Jay (Tobias Jelinek) were just as close off-screen as they were when they were stirring up trouble on-screen. "I was 15, so for the first month of so, my mom had to come with me. He turned 18 while we were filming, so we convinced by mom to let him sign as my guardian," Jelinek revealed. Yep, Ice was Jay's legal guardian during filming. "We were two kids with too much per diem having a lot of fun," Jelinek added, noting Hocus Pocus was his first audition ever. Tubular! 11. For Bagby, having to shave "ICE" in the back of his head wasn't exactly the easiest haircut to have at the time. "I went to church with my mom and dad and i had to wear a hat backwards mostly to cover it," he recalled. "But then you go to church, you can't wear a hat! Everyone was like, 'Oh, what's happening with that Bagby kid? Has he gone off the deep end?! he must be in one of those new gangs or something!'" 12. While they referred to the Sanderson Sisters as "ugly chicks" in one of their scenes with the trio, both Bagby and Jelinek were in awe of Parker while filming, with Jelinek revealing Bagby had a "major crush" on her. "Still do!" Bagby added. "The fact that she was Ferris Bueller's girlfriend! That blew my mind," Jelinek said, referring to SJP's now-husband Matthew Broderick. "I just remember how cool she was. She had that hippie chic thing going on." 13. That scene where William "Billy" Butcherson, Winifred's dead ex cuts his mouth open to finally speak only to have moths fly out? Those were real moths in actor Doug Jones' mouth. And it was a difficult task to get it right pre-CGI advancing to what it is today. "That took some work because if they get moist they don' fly. Mouths are nothing but saliva, so we had to protect them from the moisture of my mouth. So we put a dental dame in there and a latex sheath and they put the moths in with tweezers and we had to do it at the last minute when the cameras were rolling so I could cut the stitches open, cough out the dust and moths and they would fly," Jones, known for his performance in the Oscar-winning film The Shape of Water, explained. "The first take I did it though, a light broke right after they got it all set it up...they finally get it fixed real quick and I cut it open and what comes out but a stream of mud and these moths just kind of surfing on it. Take two, we got it right!" 14. Jones' audition process to play Billy, who had been in a coffin for 300 years before being brought back from the dead, was also unusual. We was brought into a dance studio with Ortega, a celebrated choreographer, who wanted to what Jones was physically capable of. "He said,' You're going to wake up in that position there and walk over to here after 300 years, go!' So I just had to come up with an act on my own on the spot," Jones said. "He loved everything I did. He laughed hysterically. And by the time I got home I had the part!" 15. While Billy's mummified hair and make-up looked like it would take a long time, Jones said he was surprised by how quick the process was. "They had it down to one prosthetic piece they they glued on pretty quickly," he said. "They just had to glue it on and touch it up, so they got it down to an hour and a half. For prosthetic, that's nothing! Beauty make-up takes longer. I got off easy on that one." 16. What was Katz's next role after playing Max Dennison? A Deadhead...but for real. However, the nickname Max was given in the movie by bullies Ice and Jay did extend beyond the Hocus Pocus set. "Right after making this movie I went and followed The Grateful Dead for like three or fours years and that was my Grateful Dead lot name: Hollywood," Katz told us. "Everybody used to say, ‘What's up, Hollywood?!'" And no, he didn't hold onto Max's tie-dye shirt from the movie to wear. "I was making my own, man," he said. 17. The scenes with Winifred, Mary and Sarah flying on broomsticks? They were basically real, as Katz was amazed by "how [the crew] operated to get the witches to fly. There was no CGI! There were four dudes moving them!" 18. Someone whose never seen Hocus Pocus? SJP! When asked when she watched it last, she admitted to Buzzfeed, "Never! Or maybe when it came out." 19. The young trio from the film, Katz, Shaw and Birch, have remained close throughout the years, especially after reuniting for the 20th Anniversary at the Walt Disney Studio Lot in 2013. "It was like, 'Oh wait, we love each other, why aren't we hanging out?!'" Shaw said. "[We] went out for dinner one Halloween, it was perfect. We're still connected after that." 20. While Birch "loved" making the movie, she did regret not getting to spend even more time with Midler, Parker and Najimy on set. "I always would get upset because were always working at a time they weren't working and the few times we got together when the six of us were all working together it was just so much fun," she said. "The energy was amped up and you never knew what was going to happen and all that. They were incredible. Just seeing Bette's dedication to her character and Sarah's playfulness and Kathy was always giving me a hug and making me laugh. Everyone was so great."